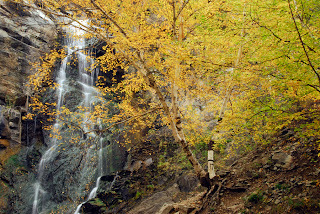 Spearfish Canyon is in the northern Black Hills. Highway 14A, the "Spearfish Canyon Scenic Byway," runs roughly north and south between the town of Spearfish and Cheyenne Crossing. 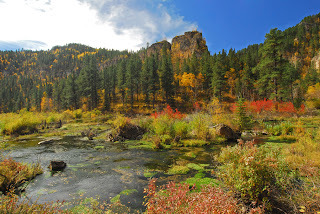 While beautiful any time of year, "the canyon" as the locals call it is especially so in spring when Spearfish Creek and three waterfalls run swiftly, and in autumn, when it gives one of the Black Hills most spectacular displays of fall foliage. First set your odometer to zero at the three-way stop on East Colorado Boulevard in Spearfish, near the entrance to the Spearfish Canyon Country Club. From here Highway 14A leads you into the mouth of the canyon. Don't despair at the lack of water in the creekbed alongside the road, you will hit water at a small dam at the 4.1 mile mark. 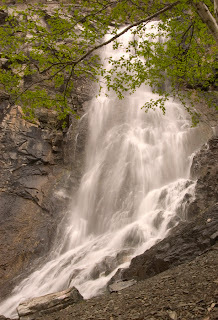 At 6 miles you will see a large turnout on the right side of the road and a sign for Bridal Veil Falls. (GPS N44-24-957 W103-52-847) This is probably the tallest waterfall in South Dakota and is easily visible from the southernmost end of the parking area. You can shoot from the road, or if the creek is not running too swiftly, carefully cross it and move up close to the waterfall. Here's the standard view from the road (below). And a bit closer view of the falls. As I said, crossing the stream and getting to this point means walking on a lot of wet, slippery rocks. Please Be Careful! The rock canyon wall that Bridal Veil cascades down faces toward the west, so gets more sunlight in the afternoon. While this is a spectacular waterfall in spring and wet times, in late summer and/or dry years it can dwindle to a bit of a trickle. Continuing on, you will come to the village of Savoy at the 13.5 mile mark. This is pretty much made up of Spearfish Canyon Lodge on one side of the highway and the Latchstring Inn restaurant on the other. 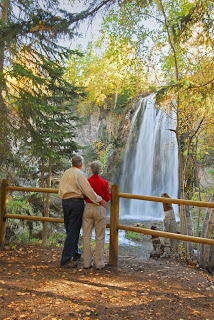 Here you have several choices - continue on the main road, turn right onto a gravel road that leads past the lodge parking lot to Roughlock Falls, or park and hike down to Spearfish Falls below the restaurant. The walking trail to Spearfish Falls is a loop that starts at either end of the Latchstring Inn parking areas. No matter which way you start you will drop into the very bottom of the canyon and come to a breathtaking intimate view of the falls (below). Unfortunately, there are not a lot of options for different angles here unless you want to wade the creek, which I haven't tried and don't recommend. The falls face roughly to the east, so get sunlight on them in the morning. However, due to the steep canyon walls surrounding the area, direct light on the waterfall is not very common and does not last for long when it does hit there. Luckily, most of us who shoot waterfalls would rather have a bit darker subject so we can use a slow shutter speed for that misty/dreamy look. Even in dry times, this waterfall seems to have a good continuous flow. I've never been disappointed with the amount of water to be found here. Following the gravel road past the Spearfish Canyon Lodge parking lot for a one-mile detour off the main highway will lead you past several beaver ponds and to Roughlock Falls. Roughlock has been fenced off for several years and photography has been severly limited in that time. Good news, however! In 2007 the South Dakota Game, Fish and Parks Department took over ownership of the area and is rebuilding walkways, picnic areas and viewing platforms. By summer 2008 the falls and area around it should be accessible again. I will post more about this area when I get a chance to see the improvements, so for now we will leave it alone. Autumn in the Black Hills typically means yellow aspen and birch leaves. The search for other colors is sometimes frustrating. This bit of red (below) was found in the beaver ponds on the gravel road between Spearfish Canyon Lodge and Roughlock Falls. 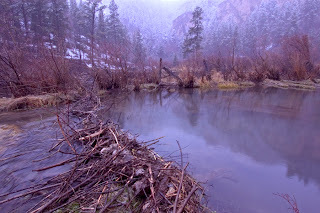 Even a cold, snowy day in Spearfish Canyon can provide great photo opportunities. Here is the same beaver pond as above, but in a different season. Continuing on past the Roughlock parking area another 2.1 miles you will find a small dirt turnout on the right side of the road. This is where the final scenes in Kevin Costner's epic "Dances With Wolves" were filmed. You can recognize the rock that a wolf howls from and the site of the winter encampment of teepees. A wooden sign marks the spot, but vandals quite often steal it or destroy it, so it may not be there when you visit. Returning to the main highway at the Spearfish Canyon Lodge and continuing south will take you to a beautiful pond beside the road at the 14.5 mile point if you did not take the Roughlock and "Dances With Wolves" detour (20.2 if you did). Fly fishermen find this pond irresistible and they can add an interesting touch of human scale to the landscape. You may have already spotted fishermen anywhere along the creek as you traveled to this point. There are also numerous cascades and tiny rapids in the creek that can make for nice photos. Please use turnouts and picnic areas to park and photograph these areas. The canyon road is narrow and winding enough without vehicles parked along the shoulder causing more hazards. The 24.7 mile mark is the official end of Spearfish Canyon at the Cheyenne Crossing restaurant/gift shop/gas station and Black Hills Winery. It's a great rest stop and is famous for Indian tacos.